Your travel adventures are fast-approaching. Are you running short on space and time? If so, you need these 10 smart packing hacks to pack more in less time. Does the idea of packing a suitcase before taking a trip stress you out beyond belief? You’re not the only one who feels this way! According to a study done in 2017, more than 50 percent of Americans said they would rather abstain from alcohol for a month or give up social media for a week than pack a bag for vacation. If you fall into this category, you should consider rethinking the way you go about packing a suitcase. There are all kinds of packing hacks you can put to good use to make packing a more pleasant experience overall. Check out 10 smart packing hacks below that will help you pack more in less time while eliminating a lot of the stress that often accompanies preparing for a trip. 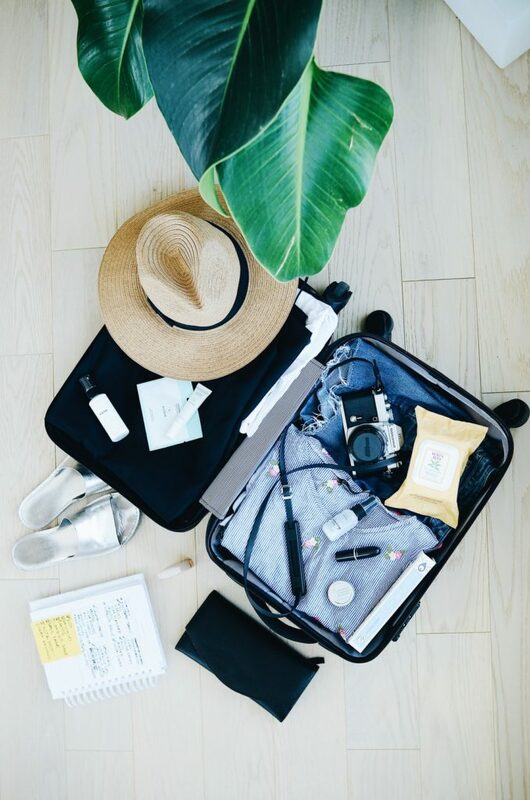 The first thing you should do before you start packing a suitcase for a vacation or business trip is create a packing checklist for yourself. Ideally, you should put this packing checklist together about a week or two before you actually start packing. It should include everything from clothes and toiletries to any out-of-the-ordinary items you might want to bring along on your trip. People run into trouble when they pull out their suitcase and start stuffing it with random items without having a plan in mind. Before they know it, their bag is full and they don’t have half the things they actually need to bring with them when they travel. Clothing is going to take up the majority of the space in your suitcase when you travel. So you should be strategic about how you pack it. One of the best ways to approach packing clothes is by assembling complete outfits that you want to wear during a trip. Rather than pulling out a pile of shirts, a stack of pants, and more and throwing it in your bag, lay out each outfit you’re planning to wear. This will help you cut down on the amount of clothing you bring on your trip. It’ll also make it easier for you to get dressed each day once you arrive at your final destination. People who travel on a regular basis swear by this packing hack. They’ll tell you that rolling your clothes rather than folding them will help them to take up a lot less space. This might not necessarily be an option for everyone. If, for instance, you have a lot of business attire that you’re taking on your trip, it might not make sense for you to roll everything up and risk wrinkling it in dramatic fashion. But generally speaking, rolling up T-shirts, jeans, and other basic clothing items should cut down on the total amount of space that your clothes take up. Deciding which shoes to pack for a vacation can be one of the most difficult decisions people have to make. They often want to bring along everything from flip-flops and casual sneakers to dress shoes, heels, and other more formal footwear. Your best bet is to find shoes that can serve multiple purposes. For example, there are some fashion sneakers that you could wear both for sightseeing and for a nice night out on the town. If possible, try to limit yourself to just two or three pairs of shoes, tops. Otherwise, you stand almost no chance of fitting everything inside of your luggage neatly. While shoes can take up a lot of space inside a suitcase, they can also offer you a simple storage solution. You can place things inside of your shoes to conserve space. Slip a bunch of pairs of socks into your shoes the next time you’re packing for a trip. It’ll cut down on the amount of space your socks take up and help keep your shoes intact throughout the duration of your travels. Most people will throw some “extra” clothing into their luggage when packing, just in case. They’ll pack extra socks, extra underwear, and an extra shirt or two. This isn’t the worst idea in the world, but you should be mindful of how many “extras” you’re packing. It’s easy to get carried away and end up with way more clothes than you could ever need. Do you have a toiletries bag that is dedicated specifically to your travels? If not, you should get one now and set it aside for travel purposes only. The bag should include a toothbrush, toothpaste, soap, shampoo, deodorant, makeup, and everything else you need in the bathroom when you’re away from home. Don’t touch it in between trips and you won’t have to worry about repacking a toiletries bag before every vacation. No matter how diligent you are about packing efficiently for a trip, your suitcase is probably going to fall into a state of disarray the moment you open it when you reach your destination. Clothes, shoes, toiletries, and more are going to come spilling out and force you to reorganize everything. Packing cubes can prevent this from happening. You can neatly organize everything in your packing cubes at home before placing them into your suitcase and know exactly where everything is once you arrive at your hotel later. From basic four-piece packing cube sets found on this useful page to customized packing cube options, you can get your hands on packing cubes that’ll make life easier on you every single time you travel. When you’re preparing for a vacation, laundry is likely the last thing on your mind. But when you return home from vacation, it’s something you’re going to have to do. Make it easier by bringing a laundry bag along for your trip. You can fill it with dirty clothes and keep your hotel room clean in the process. 10. Don’t Put Off Packing Until the Last Minute! The same 2017 study that we referenced earlier found that about 65 percent of people believe packing for a trip would be less stressful if they didn’t procrastinate while doing it. Put that theory to the test the next time you have to pack for a trip. Start early and see how much less stressed out you feel by the time it’s ready for you to go. There is always going to be a little bit of stress associated with traveling. But you don’t have to let it keep you down. Utilize these packing hacks when you’re throwing your suitcase together. They should make life easier on you and ensure you don’t forget anything when you take flight. Would you like to learn about some of the best places to visit this winter? Check out our blog about suggestions on where to go to beat the winter blues.